Is Lamont Gaillard The Hidden Gem The Redskins Interior OL Needs? Share Is Lamont Gaillard The Hidden Gem The Redskins Interior OL Needs? Lamont Gaillard was a 4-star defensive line prospect from Fayetteville, North Carolina. It is rare that a 4-star talent is asked to switch positions but it all started when the Georgia offensive line coach wanted to Gaillard to get some reps in at guard during a spring practice his freshman season. He did pretty well and was moved to right guard going into his redshirt freshman season and got some game action. His redshirt sophomore season he started all 13 games and right guard. Going into the 2017 season Georgia needed to find a starter at center and Gaillard answered the call starting all 15 games. This past season he started every game again and was named team captain and received 2018 All-SEC honors as well. 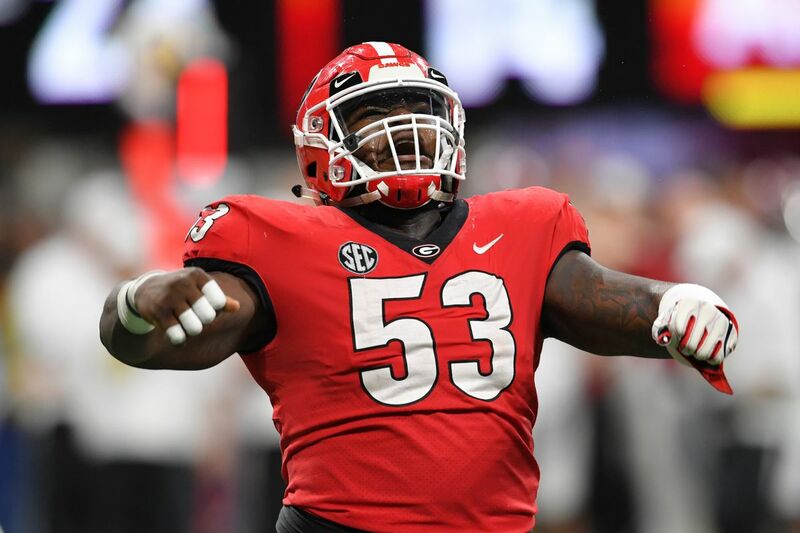 His game isn’t always pretty but he always found a way to clear rushing lanes for the likes of Nick Chubb, Sony Michel, and DeAndre Swift among others which has helped Georgia maintain its prolific rushing attack over the years. He’s described as intelligent and tough with the leadership quality you want at the position. He’s a mauler who has relied on his strength and his attitude to win match ups in college but he has both the physical and mental tools to become a legit starter down the road with some development. Good size, strength, arm length, and finishing for the position. He’s a mauler who works in a phone booth but is just somehow able to clear rushing lanes despite his lack of refined technique. Hand placement is generally good and he generates so much power in his punch and arm extension that he can simply overpower his opponents. Footwork, core, and base are just good enough that he can absorb power rushers and reset and anchor. Has good enough athletic ability to get to his assignment on the second level or while pulling. Has experience at guard and center. Plays with good recognition and seems to identify stunts and twists. Pre snap he is responsible for pointing out linebacker position and making line adjustments. Regarded as a tough guy with leadership quality. Finishes blocks with a mean streak. Technique is inconsistent and all over the plays at times. Terrible habit of dropping head down once he snaps the ball this can cause him to whiff at times. He bends at the waist and compromises leverage causing balance issues. Can be beat by speed interior rushers and needs to learn how to handle that as well as how to combat counter moves by defensive linemen. Once beat he doesn’t really have a chance at recovery. Much better as a run blocker than pass protector because his footwork is dragging behind and he can lose contact and control. While I appreciate that he looks to help out his teammates he needs to make sure his assignment is handled first. I saw some strange and inexplicable blocks pass off because his attention got caught up elsewhere. Gaillard is definitely a raw player and relatively inexperienced at the position but I can see why some scouts, especially those looking for a player with some strength and power in the middle of the defense, would be excited about his upside. His mauling and phone booth ability would certainly be welcome in a power scheme like the Redskins but he’s going to really have to improve his fundamentals before he is ready to start. It may take Gaillard a season or two before he is up to the task of starting but I think he is certainly a project worth developing especially if the Redskins wait yet again on iOL help in the draft. In a really shallow center class is hard to predict exactly when and where he goes but if he makes it to the Redskins second 3rd round pick or even better, day 3 of the draft, I would hope he would start entering the discussion. While he looked pretty good at center these past two years I think he could be similarly effective at LG eventually. Though he may not see the field as a starter immediately he would give the team some versatility and depth at both positions while he is working on his game. NFL Mock Draft 2019: Todd McShay and Mel Kiper, Jr. give the Redskins some new talent One week until the mocks stop! Redskins agree to 3 year, $21.75 million extension with DE Matt Ioannidis IonMan! NFL Free Agency 2019: Redskins sign former AAF QB Josh Woodrum QB problem fixed!